Until a few years ago, most of the flange-sized assemblies were derived from a single form factor as in the image to the right. 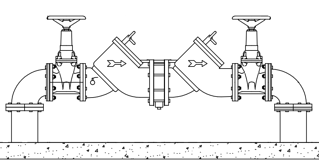 A vertical riser through the floor turned with a ninety and then there is a series of gates and valves, all oriented horizontally in succession, then another ninety back down through the slab. In recent years, the waterworks manufacturers have perfected a new assembly design known as the n-type assembly. This assembly is significantly smaller than the traditional models that fill our landscape today. In fact, making this change can reduce the size of backflow enclosures by 70%! Additionally, there is a difference in price between the two designs, as well as (something about head loss here). The new “n-type” backflow preventer solutions turn the shutoff valves into the horizontal plane and place the nineties within the boundaries of the shutoff valves rather than beyond them. The result is a much more compact assembly. And with a smaller assembly, you get a much smaller backflow cover - that's right, up to 70% smaller. Let's take a look at an example. On the left we have the familiar horizontal or inline backflow preventer assembly (BPA), the design that has been around for decades. This is an 8-inch backflow system and it sports a hefty wye strainer immediately prior to the first check valve. 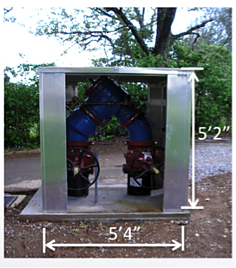 When fitted with OS&Y valve shut-offs (not shown), the industrial enclosure for this bad boy is twelve feet long and six feet, eight inches tall. When a property owner is forced to drive around this as he enters his property, it is said that he is often overcome with the sudden urge to knock somebody out. Alternatively, on the right we see another 8-inch backflow system. The BPA is an n-pattern design. The backflow cover for this baby is just five feet, four inches square, and it’s 62 inches tall, even with OS&Y valve shut-offs! Which solution would you prefer? If your client has a choice, there is little doubt which version will be preferred. But these n-types have not caught on. The sales rep for a large waterworks distributor in Texas recently guessed that of all the BPAs they ship in and around the state, about 2% are n-type. These BPAs are not being offered on supply house bids because they’re more expensive. Not much more, but more, nonetheless. At the end of the day, when discounts are added and deals are tightened, the n-pattern assembly is unavoidably about 8% more expensive. When a supply house bids an entire project, they are seeking to win the bid by offering the contractor the best price. Suggesting a more expensive BPA than is absolutely necessary, even if it’s only a few hundred dollars more, is a sure-fire way to lose the total bid package. The good news for your client is that at the end of the day the total package, including the BPA and the backflow enclosure, is not more expensive. Because these assemblies are so much more compact, the enclosures that surround them are much smaller and therefore, less expensive: enough to offset the added cost. Of course, supply houses are usually aware of this but while the BPA is commonly part of the initial bid package, the industrial enclosure is usually not. That omission, the lack of a backflow cover in the bid list, hides the evening effect of the total package cost. So even though the property owner is getting a higher preference, which in the hallowed halls of economic theory means it is worth more, the solution is often less expensive. So even if you are reluctant to specify an actual model number from a specific manufacturer, you should always specify n-type as the assembly type because while some are smaller than others, every n-pattern design from all the major manufacturers is smaller than their conventional brethren. Learn about even more trends in backflow preventer design and installation in our free guide. If you compare the flow rates and pressure drops of all the major backflow manufacturers (Watts, Wilkins, Ames, Febco and Apollo), you will find there is a negligible difference between n-pattern and inline style backflow preventers. You can see an example to the right for a 4" Watts 957 RPZ backflow preventer. The three lines represent a z-pattern, n-pattern, and horizontal (inline). In most cases, the pressure drops are virtually identical. The largest exception is only a 2.5lb differential, which is still a tiny margin when considering hundreds of gallons per minute. You may be surprised to learn there are also a few examples of the n-pattern actually having a lower pressure drop than the inline style. This can probably be attributed to the hydraulics of the incoming pressure being "siphoned" by the outlet pressure. Regardless, the overall analysis reveals a minimal pressure drop difference between inline style backflow preventers and n-type style. These new and certainly improved n-pattern backflow preventers are becoming more prevalent. It makes sense. They are much smaller than the old school inline devices - up to 70% smaller. However, they are sometimes dismissed because of outdated arguments about price and head loss. As you know now, it is actually more cost effective to specify an n-type in an enclosure, because the enclosure will be significantly less expensive. 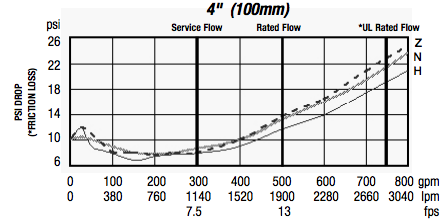 The old argument about increased head loss is also easily debunked with a look at the flow rates and pressure drops of all the major backflow manufacturers. It's time to stop focusing on the now irrelevant downsides, and see the big picture. An n-type backflow preventer is a better choice than the traditional inline device.